Chris Grimley and Kelly Smith, a husband/wife team that are "collectively architects, interior, graphic, furniture, urban and textile designers," have recently started their own product design company, etcetera media. Previously operating via an Etsy store selling one-off clothing, bags, and home goods, they know have their own website and online store. They also have a showroom in the South End that is available by appointment. 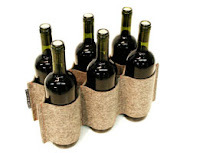 Their 6-pocket Wine Rack, is made from naturally renewable materials, holds (you guessed it) up to six bottles, and collapses flat when not in use.